The purpose of Performance Improvement (PI) is to leverage insights and automation to improve processes across ECU that results in increasing capacity, improving the experience of staff and students reducing costs and ultimately assisting to grow revenue. PI follows a simple 5 step approach from Idea Capture to Handover, Transition and Monitor. Semi or fully automate manual transactions to create capacity for resources? Improve decision making through business insight and intelligence? If the above questions exist within your area then PI can assist with capturing, assessing, prioritising and implementing these opportunities for value creation. The purpose of this Idea Capture is to provide an easy medium through which productivity improvement opportunities can be recorded for further investigation. This step is not designed to capture an exhaustive description of the idea, but rather to provide enough information to inform the value to ECU and to assess the idea. The purpose of this Idea Assessment and Filter step is to provide the opportunity to rate an idea in terms of its potential impact and value using ECU's PI Assessment framework. In the event, the idea could be a potential candidate for Robotic Process Automation (RPA), then the RPA fitness Assessment shall be conducted. The Selection Case & Endorsement stage is designed to capture additional detail for an idea that has passed through filtering and progressed into the selection stage as a candidate for implementation. The Selection Case requires the PI Team to determine value, complexity, risks and cost for a potential PI initiative. Steering Committee will be responsible to endorse the Selection Case(s). 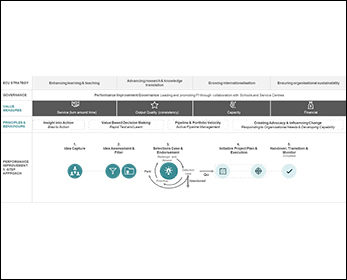 The purpose of this Initiative Project Plan and Execution step is to setup all Project Plan, Status, Reporting, Process Mapping and project Execution. The scope of work and deliverables will be determined and reflected in the Project Plan. Status Reporting for project tracking and cost benefit tracking dashboard will be in Tableau. The purpose of this Handover, Transition and Monitor is to ensure the PI initiative closure will be handled adequately. Key aspects of this phase is the Handover Report and Post Implementation Review sign off.